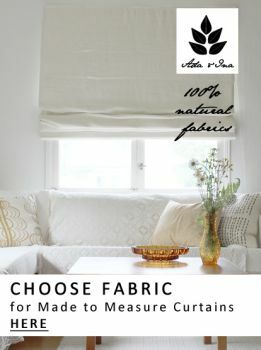 In our custom linen curtains collection you may choose any of our fabrics – at the moment we have over 1000 fabrics available! We like to think our fabrics are all elegant and perfect for your curtains. Apparently we're not alone, based on the delightful feedback we tend to get from our lovely customers! If you are looking for something special, a certain fabric with just the heading type you like or you want to specify the exact measurements, we think you will love our Bespoke curtains, often called as made to measure curtains or custom made curtains. We will sew your curtains with specified width and drop (for some headings you may choose heading height as well). The most exciting thing is you may order these made of any fabric in our vast collection of 300 fabrics - and growing! Here are some ideas and uses for our curtains. All curtains are available in our custom made curtain collection. Thermal curtains are never to be underestimated when the winter is closing in. Save on warming bills! Contemporary curtains – some ideas for your home! Cotton curtains have slightly different characteristics from linen curtains, but we love them just us much! Voile curtains to block the view in but still enjoy the sun inside. Fire retardant curtains are a must to commercial premises but also available to anyone that thinks you can never be too much on the safe side. We warmly recommend that you order fabric samples first. We offer 5 free samples and send these to you usually the same or next working day. When you have received your samples, you're more than welcome to place an order online, you you may always contact us for any assistance you might need. Call us or send an email – we are more than happy to help! These guides will help you in choosing your curtains and measuring them.